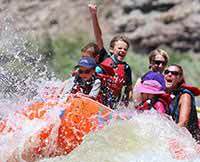 I did the Grand Canyon 7 day white water rafting trip with my father 18 years ago and went again on June 10, 2015 with a friend. Not much has changed in those 18 years which is a good thing. From making the reservation initially (and do it early because they fill up quick) to the flight from Bar 10 back to Marble Canyon, this is a top notch organization that knows what they're doing. They are in the customer satisfaction business and it really shows. The Western River guides were GREAT. 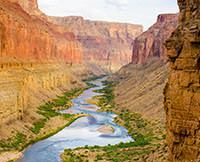 Safe, fun, personable, friendly, knowledgeable, and above all very passionate about the Grand Canyon. You can tell they just love what they do. And they cook up some damn good food too! We stopped for numerous hikes and got to see the Indian granaries and waterfalls. And more beautiful waterfalls. And crystal blue pools. And more waterfalls. Deer Creek Falls/The Patio and Havasu were spectacular. The whitewater rapids are non-stop and the water is cold, so bring your rain gear, and wear it. The food was excellent and there was more than enough - I swore I was going to lose 5 lb and I gained 3 lb.but it was worth it. 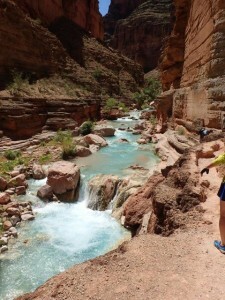 This was my 7th trip with Western River (4 Green River, 1 Cataract, and now 2 Grand Canyon) and I didn't even think to look at other options when booking this trip. My friend that went with me is already planning to bring his wife the next time. This is a must do trip!! !